Pilots come aboard ship to assist the crew during the most critical and potentially hazardous phases of a voyage. Qualified pilots possess particular local knowledge and have the necessary ship-handling skills to assist the safe arrival and departure of vessels. Normally, pilots board and disembark using a traditional rope ladder from and to a pilot boat. However, this can be a very dangerous procedure if those involved do not adhere to International Maritime Organization (IMO) standards or fail to practise acceptable seamanship skills. A number of pilots have died as a result of accidents while boarding/disembarking from ships, and many more have been seriously injured. Furthermore, deficiencies with regard to boarding arrangements and unsafe rigging of pilot ladders continue to be detected during port state control inspections, resulting in delays and financial penalties for the ship operator. Nevertheless, pilot ladders remain the most safe and efficient way to board ships at sea and there is usually no alternative, except on occasions when a helicopter is used. The following guidance is intended to remind seafarers and shipping companies of the vital importance of adhering to the rules and established procedures concerning the provision of safe boarding arrangements for pilots. 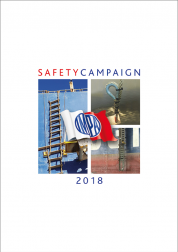 The IMO Convention for Safety of Life at Sea (SOLAS Chapter V, Regulation 23) sets out the principal requirements for the rigging of pilot ladders. These provisions are set out in the diagram contained in this brochure. It is also reproduced in the ICS Bridge Procedures Guide. There is further detailed technical specification for pilot ladders in IMO Resolution A.1045(27). Shipping companies have a legal obligation to provide a conforming ladder and ship-borne fittings. If seafarers are uncertain about any of the requirements, they should always ask their supervising officer for advice. The two major causes of accidents are defects in the ladder treads or sideropes (see diagram) or a lack of proper attachment of the ladder to the vessel. Seafarers should always check the condition of the ladder before it is rigged and also ensure it is secure to the ship. Whilst this is done, seafarers should always take care of their own safety, wearing a life jacket (and a life-line if appropriate).